If you're new you may want to follow along on FaceBook. Posts and pages may contain affiliate links. Thanks for visiting! My friend, deciding to home school is huge! As you begin this journey, take a few minutes to decide what you really hope to accomplish as a home schooling family. You now have amazing options you would never have with your kids pursuing a public or private school education. You have the freedom and challenge of doing what is right for your family and for your child! This post contains affiliate links. I was compensated for my time in exchange for my honest opinion. Most of us, me included, find becoming a home school family exhilarating, freeing, and honestly, a little scary. Making choices about your kids’ education is a huge responsibility, but also a great honor! Choosing the right home school planner can greatly assist you and your family with making hard choices of which there will suddenly seem to be thousands! What is your vision for your home school? What are the unique needs and learning styles of your children? Do you want to home school all year or seasonally? Do you want to use loop scheduling or block scheduling and for what subjects? What educational philosophy is most appropriate for your family (Charlotte Mason, Classical, Unschooling)? What curriculum should you use? Which books should you buy? How much do you need to spend? Friend, it is for all of us. When I first started home schooling my preschoolers, I thought it was crazy to purchase a home school planner and organizer. So, I kept putting off the decision. Now, with a kindergartner, a preschooler, and an unbearably cute little one ready to start some fun sensory activities I’m excited to finally have a home school planner that meets my needs. Having researched and sadly purchased more than a reasonable number of planners touting that they were the “best planner for home school moms,” I finally found the right fit for my family. Let me offer you some advice on what the best home school planner can offer you! You’ll know you have found the best home school planner for you when the following statements are true. 1 – Your home school planner ties into your big picture goals. There are lots of home school planners out there with beautiful pictures and encouraging quotes, but the most inspiring moment of all is realizing that what you are doing day to day is matching your overall goals for your kid’s future! I highly recommend finding a planner that guides you through the steps of envisioning what you want for you, for your kids, and for your family. Look for planners that include goal worksheets that can be used to turn big picture goals into achievable steps! Our favorite home school planner comes with an amazing planning kit which really helps us focus on what we are hoping to accomplish with our year! 2 – Your home school lesson planner helps you choose what to study. By definition home school involves the study of something. What do you want them to learn and how do you want them to learn? Planners that have pages devoted to helping you decide which subjects you wish to cover can help you streamline which materials you want to purchase. This is a huge advantage over planners that assume just one curriculum will fit every student for an entire year. A true bonus with the planner we use is that there is space for recording curriculum resources for each student, a curriculum shopping list to help me avoid overspending, and a resource planning list. Finally, all those post it notes all over my home can find one home! 3 – You have a printable home school planner for increased flexibility. With more than one child or more than one curriculum, flexibility becomes key very quickly. Some subjects you may wish to approach on a loop schedule. Others you may find to work better on a block schedule. Throw in a unit study or two and you suddenly need three different planners, unless you have one that is flexible and enables customization like this one. If you have no idea what block scheduling, loop scheduling, or unit study means; don’t worry, this planner explains them all in addition to making space for them! Most importantly, you may find that you need to make changes as the year progresses and you and the kids continue to grow and learn together! Consider planners that can easily be restructured, reprinted, and rethought! 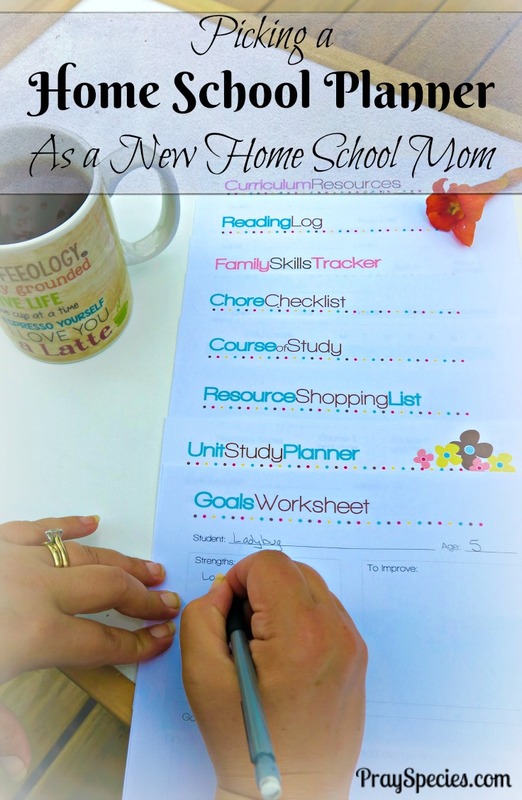 4 – Your home school planner and organizer meshes well with your real life. I quickly found that traditional planners listing times (8 a.m.) on the left with lines on the right to record activities did little for me as a home school mom. I desperately needed a printable home school planner that allowed me to plan within our routine for the day as opposed to filling out an inflexible schedule. Look for a planner that encourages you and enables you to plan the way your family operates. My homeschool mom planner allows me to schedule some of our subjects as loop topics and others as block subjects. Our planner adjusts to our seasonal learning styles and can be used as a year round home school planner. There is also space to build book lists and keep records of the kids’ accomplishments. This can easily be converted into a transcript we can use to provide official documentation when needed. Make sure to check your state requirements and find a planner that can help you record what your state requires! 5 – Your home school planner is a good investment. A home school lesson planner that can grow with you and your family without always costing more money for more pages can save a ton of money very quickly. We are a huge fan of this planner because the forms are all online and completely editable. I can reprint and edit as many times as I would like! Plus all those homeschool planner printables I loved this year are already updated and available for next year! I can access them every year for life without any additional out of pocket cost. Some bonuses offered by my favorite home school planner! If you are a new home school Mom take heart. You are in good company! We are so blessed in this generation to have so many wonderful and amazing home school Moms who have gone before us! Many of them have written blogs, books, podcasts, etc. to help us get started and stay on track. Here are just a few of my absolute favorite resources for getting started with home schooling!